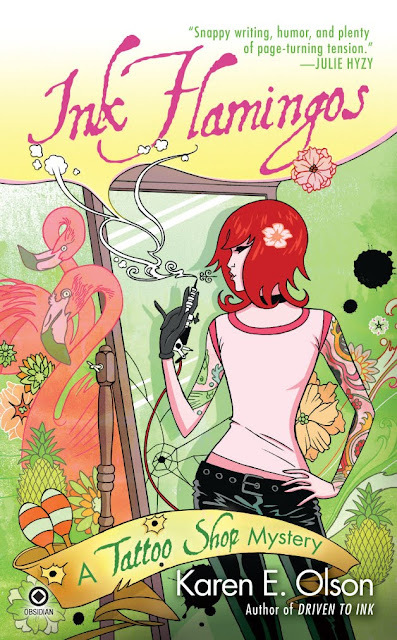 Full disclosure: Ink Flamingos , by Karen E. Olson, features a tattoo blogger who is an instrumental figure in the narrative. I also have it on good authority that Tattoosday was, in part, inspiration for this plot point. And yes, Ms. Olson thanks me in the acknowledgements, much more profusely than I anticipated. All that being said, skeptics might argue that there was a snowball’s chance in hell that, here on Tattoosday, you’d see a negative review of this, the fourth installment in the Tattoo Shop Mystery series. Fortunately for me, I have no moral dilemma, as Ink Flamingos is, like its predecessors, a great read. All bloggy plot points aside, I can whole-heartedly recommend not just the book, but all four volumes. They are consistently fun, humorous, exciting and, quite importantly, respectful to the tattoo industry and the good people therein. Before I continue, however, I’ll point you to my previous reviews of Driven to Ink, Pretty in Ink, and The Missing Ink for the whole suite of opinions on Ms. Olson’s tattoo-themed work. Click on the titles to be transported back in time to my reviews. As flattering as it was to learn that I helped, in part, inspire the blogging aspect of this latest volume in the series, I took pause when I learned that the blogger was not a benign presence in the novel. Fortunately, Olson’s easy-going narrative style, transported me past my initial misgivings, and into the brisk current of the story. Despite the presence of the blogger, the real meat of the mystery derives from the dead rock singer, who appears to have been the victim of a an allergic reaction to some color ink, and a doppelganger/impersonator of our heroine, tattooist Brett Cavanaugh, that shines the spotlight on her as a suspect, at least in the eyes of some. The whole cast of characters is back, as we watch Brett go very easily from being determined to not getting involved to rapid ascension into the thick of police matters. We get a little less Bitsy and Dr. Bixby, and a little more Joel this time around. But fans of Brett Cavanaugh's stormy love-him-or-hate-him relationship with her peer, Murder Ink's Jeff Coleman, will not be disappointed. And, as always, the city of Las Vegas plays an important part, as well. With Brett Cavanaugh's shop being based in an upscale casino, the character of the city in the dessert is omnipresent. Karen Olson continues to develop her characters and feature the art of tattooing at the forefront of her plot lines which, for me, is always entertaining. We've come far beyond the days of tattoos being nothing more than part of a murder suspect's characteristics, and tattoo artists being portrayed as suspects on the fringe of society. If you are reading this and just learning about the series, head on back to book 1 and start from the beginning. The series is fun and light, and treats tattooers and the tattoo industry with the respect and dignity it deserves. Remember, folks, these are murder mysteries, and their purpose is to entertain. Present volume included, Brett Cavanaugh has never bored me, and Olson knows how to spin a tale efficiently and with a sense of humor, as well. Ink Flamingos is the latest journey into the world of Brett Cavanaugh, the best damn fictional tattoo artist I know. 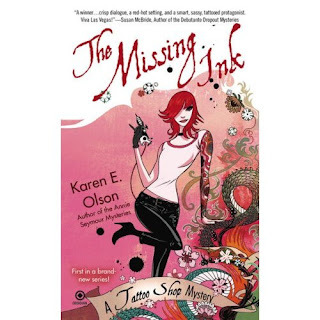 It's always a pleasure to join her as she unravels some mess, and I encourage Tattoosday readers to check out her shop in the pages of Karen E. Olson's books. It's a whole lot of fun and costs a lot less than getting a new tattoo. Ormkvinna / Pachamama / "the great goddess"